This week Michael has suggested a song from the tail-end of the Eighties, when new musical trends began to appear – such as Britpop. The song is “Made Of Stone” by The Stone Roses. It was released in 1989. And very soon I’m going to hear it for the first time. I’m remarkably ignorant of The Stone Roses’ oeuvre (I’ve only ever seen / heard one song by them, and that was “I Wanna Be Adored” which I saw once on a TV music program). 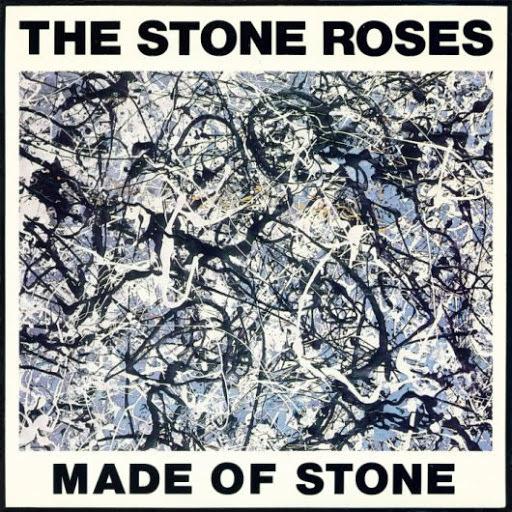 I’ve been reliably informed (mainly because I looked it up) that “Made Of Stone” is one of the tracks on The Stone Roses’ self-titled debut album, which is something I’ve never heard. (Apparently, “I Wanna Be Adored” is one of the tracks on it.) Almost every review of the album I’ve seen talks about it being seminal / epochal / revolutionary in terms of British pop music history. Because Michael suggested “Made Of Stone” this week, I now want to hear the entire seminal / epochal / revolutionary album to hear what all the fuss is/was about. And I’ll do that right after I finish this post. I’m glad Michael suggested “Made Of Stone” this week, and not only because it’s prompted me to investigate that Stone Roses album. Another reason is that the song’s title (i.e., “Made Of Stone”) reminds me of the amazing “World Of Stone”, a very early song by Australian band Hunters & Collectors. It was recorded way back when their music was primal and utterly unique, before they became a regular rock band. I’m extremely pleased The Stone Roses called their song “Made Of Stone”, otherwise I wouldn’t have had an excuse to play you “World Of Stone”. 0:00-0:18 – That’s some nice E minor jangle for the song’s introduction, followed by a little bass riff to bring in the verse. I like it. “Made Of Stone” sure is reminding me of some Australian songs. 0:00-0:18 (recap) – Nice jangle and cute bass riff. I like it. 0:18-0:29 – What a dreary vocal melody for the verse. I don’t like it. However, if you don’t mind me moving very quickly away from talking about that vocal melody, I’d prefer to talk about the instrumental backing. It exudes a vibe of moody Sixties psychedelia, with its languid chord progression (Em, D, C, B7) and half-time drums. I’m enjoying it. I just wish the vocal melody had more, uh, melody to it. But I suppose the vocal matches the low-key, psychedelic, drugged-out mood of the music. 0:29-0:33 – That’s a great little muted guitar riff to separate the first half of the verse from the second half. Love it. 0:33-0:48 – The second half of the verse uses the same chord sequence (Em, D, C, B7), but it’s a bit perkier (thanks to the regular-time drums). But more importantly for me, it has a better vocal melody. That’s a relief. 0:48-1:21 – Here’s the chorus, and after the mopiness of the verse it’s moved into musical sunlight by being centred around G major. 1:21-1:36 – This an instrumental bit that separates the chorus from the next verse. I must say that I thought the transition from the chorus to the verse was a tad awkward. In the last two bars of the chorus leading up to this wordless pre-verse thing (from 1:18-1:21), the band plays a D major chord but as soon as it does the energy level drops noticeably, and then drops a little more when the next verse starts at 1:21. Update: I’ve just listened to it again, and the transition from chorus to verse doesn’t sound as awkward as it did to me the first time. And listening to the little instrumental bit of the verse before the singing comes back in, I’m now enjoying little things that I hadn’t noticed earlier. For example (now I’m going to completely waste your time with this): the acoustic guitar arpeggio; the tom-tom work; the little 12-string guitar riff (1:35-1:36). Nope. It’s not more voices. The backing vocals are just a little louder. Trivia: From 2:18-2:22 everyone sings “Don’t these times…”, and at 2:19 the backing vocalist sings the opening note of “times” out of tune. I’m going to try really hard not to be that trivial for the rest of the song. That’s Eighties’ production values for you. I checked regardless just to make that sure that was indeed the intended sound in the song. It was. 2:53-3:02 – The swirly sound effects have mercifully gone away, and the guitar solo is still going. This is one long guitar solo. 3:19-3:52 – This is the last chorus, but there’s a bit of production awkwardness. The chorus starts on the beat at 3:20 but singer Ian Brown sings “Sometimes…” at 3:19 leading into that first beat. That’s not the awkwardness, because he does it every chorus. (The chorus begins with “Sometimes I fantasise…”.) However, this is the awkwardness: those swirly spacey sound effects continue right up until the first beat of the chorus then abruptly stop, and Mr. Brown’s voice singing “sometimes” is caught up in the sound effect, thereby making him sound like a robot. What made that awkwardness noticeable for me was that the “sometimes” is robotic but the “I” straight after it isn’t. It’s like the producer flicked a switch at 3:20 to stop Ian sounding like a robot, but forgot that Ian sings “sometimes” just before the chorus begins. Incidentally, the producer decided to keep the spacey sound effect throughout this chorus (although he did use it a little more subtly than during the guitar solo). 3:52-4:15 – A low-key ending to the song, with the band slowing down. I want to say that this is a splendid piece of slowing down by the band. It’s not an easy thing for a band to do, but the drummer is very steady and everyone’s following him splendidly. Unless I think of anything else to add (Imaginary note from blog reader: “No, Peter – don’t think of anything else”), that’ll be it for “Made Of Stone”. You are currently browsing the archives for the Stone Roses category.